The US Navy will relieve two officers and a senior enlisted sailor on a US warship that was in collision with a Philippine container ship off the coast of Japan in June. 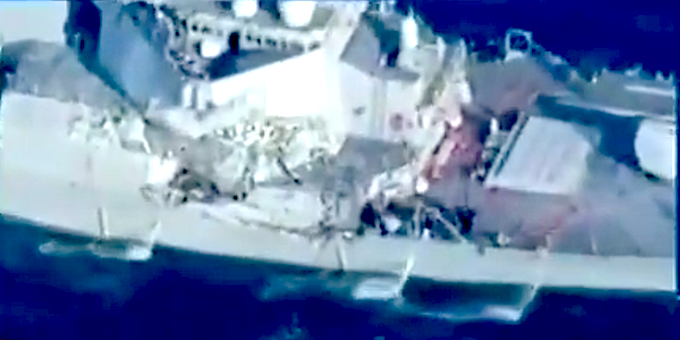 An Navy report released yesterday (Thursday, August 17) contained dramatic accounts of what happened when the freighter collided with the USS Fitzgerald, killing seven Navy sailors. Admiral Bill Moran, deputy chief of naval operations, told reporters that the USS Fitzgerald’s commander, executive officer and master chief petty officer would be removed. “We’ve lost trust and confidence in their ability to lead,” he said, adding that a further nine sailors could also face administrative punishments. The report also praised the bravery of the crew to leapt into action in an attempt to rescue their shipmates. “It was also evident from this review that the entire Fitzgerald crew demonstrated real toughness that night,” the Navy said. “Following the collision these Sailors responded with urgency, determination and creativity to save their ship. Several US and Japanese investigations are still underway into how the USS Fitzgerald, a guided missile destroyer, and the much larger ACX Crystal container ship collided near Tokyo Bay in the early hours of June 17. Under maritime conventions, the commercial vessel had the right-of-way, and the Fitzgerald, which was hit on the starboard side, was apparently at fault. However, earlier reports suggested that the cargo ship could have been on autopilot when the collision occurred. The collision tore a gash below the Fitzgerald’s waterline. The death of the seven sailors was the greatest loss of life on a US warship since 2000, when Islamic terrorists bombed the USS Cole in Yemen’s Aden harbour. Of the 35 sailors who were in Berthing 2 when the ship was struck, 28 sailors escaped the flooding and seven died. The area flooded in less than a minute. The ship’s now-suspended commanding officer, Bryce Benson, was trapped in his cabin, which was hit by the Crystal’s bow. After sailors used “a sledgehammer, kettlebell, and their bodies” to break through the door, the amount of debris forced them to remove the door’s hinges to pry it open enough for a person to squeeze through. Those who entered could see night sky, looking through an opening of ripped steel and shredded wires, according to the report. As we previously reported, among the dead was 23-year-old Carlos Victor Sibayan of Chula Vista, California, who was originally from Pasay City in Metro Manila. What is the mysterious grey haze hanging over Cebu City?